Access your account and Membership benefits for Personal, Small Business or Corporate Cards virtually anywhere you are with the Amex Mobile App. REWARDS THAT GO WHEREVER YOU DO Use Membership Rewards® points towards not only a multitude of products but also gift cards. 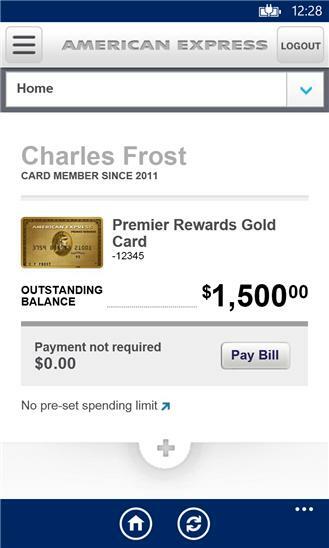 ACCESS ON THE GO Access your account, virtually anywhere you go -- quickly make a payment, and view your recent charges, activity and Membership Rewards points balance. STAY PROTECTED Log-in securely with the same user ID and Password you use on americanexpress.com. 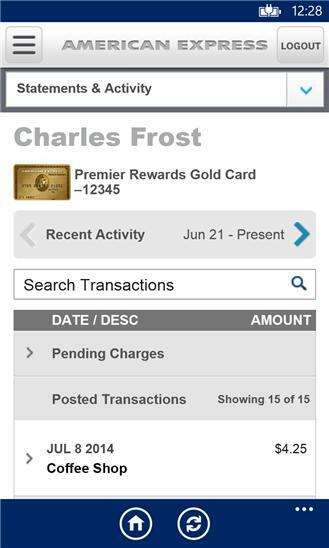 App and app features are available only for eligible Card accounts in the United States. Windows Phone is a trademark of Microsoft Corporation. All access to and use of this App is subject to and governed by the American Express End User License Agreement, Terms of Service and Privacy Statement.